What a difference a year makes: none. 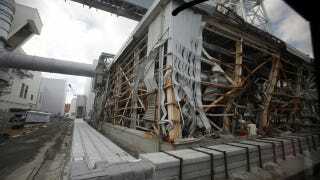 Reactor #2 at Fukushima Daichi is still leaking enough radiation to kill you. Al Jazeera reports "One of Japan's crippled nuclear reactors still has fatally high radiation levels and much less water to cool it than officials had estimated, according to an internal examination that renews doubts about the plant's stability," adding, ominously, that safety workers "will have to develop special equipment and technology to tolerate the harsh environment and decommission the plant. The process is expected to last decades." Decades. And that's likely an eager estimate. With radiation levels at ten times the fatal exposure level and coolant water evaporating away, TEPCO, the incompetent power firm which owns the plant, still has a giant radioactive mess on its bib. Sending workers toward the reactor will either kill or poison them, and pumping more water into the core will result in contaminated spillage and steam reaching the ocean and beyond.